A 2013 graduate of Peninsula College’s Automotive Technology Program, Ryan Woods has already shifted his career into high gear. He is the Battery Operations Supervisor at Automotive Research and Design (AR&D) in Port Angeles, a job he was more than ready for. 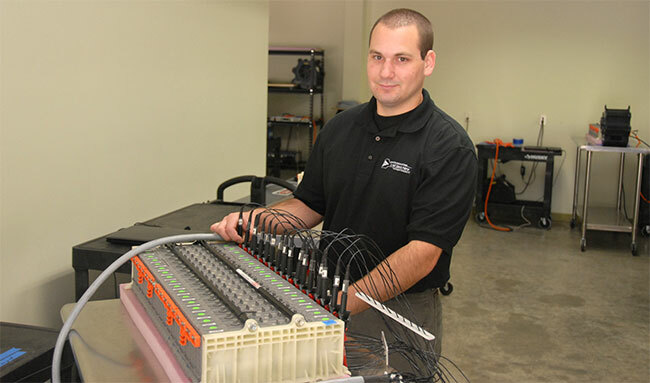 In addition to earning his AAS-T in Automotive Technology and an Automotive Technology Alternative Fuels Certificate at Peninsula College, Ryan also has NATEF certifications in Suspension and Steering, Engine Repair, Auto Transmissions and Transaxles, Heating and Air Conditioning, Electrical and Electronics, Engine Performance, and Brakes. He is also ASE certified in Brakes, Steering and Suspension, and Engine Repair. His previous work experience includes six months as a lube technician at Jiffy Lube in 2010 and two years and seven months as a technician at Ruddell Auto Mall, where he became a Bronze Level Hyundai Technician. AR&D is the perfect fit for Ryan. It is a technology company specializing in the development of Electric Vehicle (EV) and Hybrid Electric Vehicle (HEV) propulsion systems. Founded in 1987 in Detroit, MI, the company moved its headquarters to Port Angeles just two years ago. Ryan says his decision to come to Peninsula College was determined by several factors―its location, which was close to home; a very affordable cost; class size; and knowing one of the instructors, Kevin Phillips. Phillips was Ryan’s high school automotive instructor. And now that Ryan is at AR&D he can stay in close contact with the Peninsula College Automotive Program and its instructors, something he looks forward to doing. AR&D recently made a generous in-kind donation to the Peninsula College Foundation of state-of-the-art equipment for PC’s Automotive Department’s alternative fuels program. The equipment is for testing and repairing hybrid and electric vehicles and includes two high voltage battery chargers, one Gen III high voltage battery discharge unit and an infrared camera, Flir®, with the power of thermal imaging. Mike Hansen, coordinator of the college Automotive Program, says this new state-of-the-art equipment will allow students to learn how to recondition and rebuild high voltage Nickel-Metal Hybrid battery packs that are used in most modern hybrid vehicles on the road today. The Flir® camera will allow students to diagnose vehicle problems with greater accuracy, look at heat signatures of numerous vehicle components in real time on a laptop and then print the signatures. With equipment like this, it’s obvious the Automotive Program will be able to continue to train others like Ryan for good jobs and bright futures in a constantly changing and evolving industry. And Ryan will be close by, ready to lend a helping hand and talk to students who might want to know more about the career field they are entering.